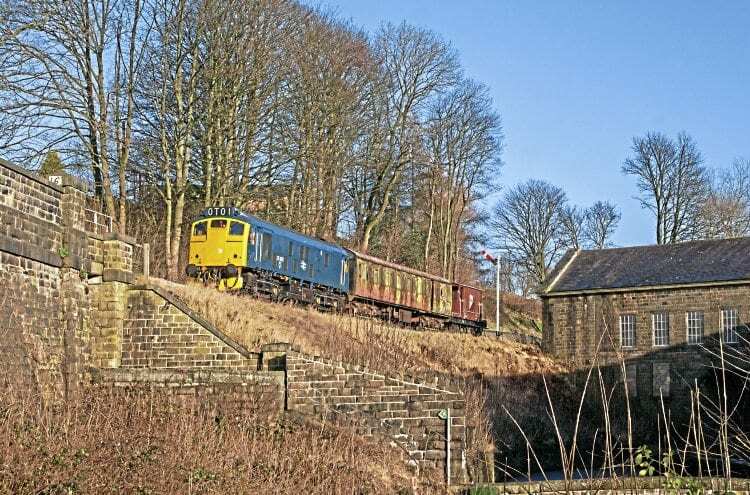 THE Keighley & Worth Valley Railway’s Class 25, No. 25059 is seen heading down the line towards Oakworth on January 6. It was taking BR Mk 1 BS No. 43145 from long-time storage to be loaded on to road transport for transfer to the Cambrian Heritage Railways, Oswestry. 25059 heads down the line towards Oakworth with an engineers’ train at the Keighley & Worth Valley Railway on 6 January 2018. The coach is being returned to operational condition following steam cleaning and stripping of loose paint. The body is in good condition and all doors are now usable. It passed its steam-heating and vacuum-brake test on January 14, with the target for return to use being this Easter.